I have been unusually complimentary about the London Cycling Campaign recently, agreeing with its statements and praising its doings (except for the new logo and website design which I have criticised as looking like something to do with giving blood). So... now to redress the balance. Ha. The cover of this month's London Cyclist magazine is terrible. It projects all the wrong messages about London cycling. I showed it to my partner, and she agreed with me: it looks aggressive. Everything about the picture is wrong. The bike is wrong, the bloke is wrong, the clothes are wrong, the shades are wrong, the pose is wrong, the angle is wrong, the background is wrong, the sky is wrong. It's totally the wrong image for a campaign devoted to promoting urban utility cycling for all. It's technically a good photograph, but a very bad photograph for the purpose. The image reinforces all the worst stereotypes of cycling being about macho men dressed in special clothes racing about on slick, pricey, non-utility bikes. What LCC should have done, which they rarely do, is to use a picture which is topical to current campaigns or to concerns of cyclists in London. So, cycling on Blackfriars Bridge would have been and ideal subject, or, more positively, in the City, the City having shown some sign of adopting pro-cycling policies recently. Generally regarded as the lightest and nippiest of rides, a good road bike will serve as commuter workhorse during the week and sportive warrior at the weekend. Will it really? No mudguards, lights or rack. Is that really a useful bike for the typical commuter? I'm not going to go all Dutch-fundamentalist on this. I don't insist on a chain guard, dynamo, integral locking, skirt guard, and impossible-to-tip-over stand. But I would like something more than a bare-bones bike appropriate to doing a time trial on to be promoted as a good "commuter workhorse". I have long wondered why the UK bike trade insists on trying to provide the wrong bikes to virtually everybody except a few cycle sport enthusiasts. Surely they should be able to see what side their bread should be buttered. Surely they should be able to see that the market for practical general-purpose bikes should be vastly larger than that for specialist sports machines. But they stubbornly go on trying to market the wrong products for the usage to which most people wish to put bikes. I really think this is a significant factor in the failure of the UK to achieve a real cycling culture. Brent Council has won funding of just under £300,000 from Transport for London (TfL) to develop and promote cycling in the borough. Brent Council has a target to increase cycling from just over one per cent currently to two per cent by 2014, and a further three per cent by 2026. Cycling has health and environmental benefits for the borough and is already a high priority in the council's Sports and Physical Activity Strategy. The council submitted a funding application request in March and has been awarded £294,500 under the Biking Boroughs scheme. As part of the GLA's commitment to cycling, Biking Boroughs aims to encourage people to cycle more in outer London. TfL hopes this will be achieved through, for example, improvements to roads and facilities, cycle training, better security and cycle promotion. This is their image of "biking" in the "Biking Borough". Is this meant to represent cycling on the North Circular Road? Why are the cyclists squashed, with non-round wheels? Are they going so fast that effects of relativistic physics are taking hold, with distance being contracted in the direction of their motion relative to the observer? (In fact, no, the distortion is the wrong way.) Cycling at close to the speed of light would indeed be a good way in which cyclists could ensure their own safety on the North Circular. Perhaps it is the only way to do it. In this way cyclists could ensure they had got all round before the motorists had even seen them, as the motorists would be seen frozen in time, virtually unmoving, in the cyclists' frame of reference. And if a collision did occur, the motor vehicle would come off very much the worse, what with the relativistic mass factor gain the cyclist would achieve at near light-speed, giving him a huge momentum. He would just slice through the car. Well, I can laugh at Brent Council's webmasters, because they are amateurs (when it comes to cycling). After all, they see so few ordinary cyclists in Brent, particularly in north Brent, where the council offices all are located, that they could be forgiven for not knowing what one looks like. But LCC should know what it is doing with these things. Look at, by contrast, the images the Cycling Embassy of Great Britain has been using on its website. None of this is to denigrate racing cycling and mountain biking and the people who enjoy those activities. I am merely indifferent to them, just as the average car driver has no interest in formula one, and the average pedestrian would guess that “bagging a munro” has something to do with the waste products of canine digestion. Only with bicycles do you get magazines that put a feature about olympic athletes next to a news item about commuter infrastructure. And that’s all part of the problem. It is indeed. The word "cycling" in English, unfortunately, means simultaneously two completely different things: the sporting activity, and the mode of transport. The same is not true of the words "driving" or "motoring". The confusion this engenders in the mind of what used to be called, back in the days when printing was black and white, "the layman", is very sad. It really holds back utility cycling in the English-speaking world. Utility cycling in the English-speaking world needs to keep explaining itself. Because a picture is worth a thousand words, getting the pictures wrong makes that task a thousand times harder. *This paragraph is a change to the one I originally wrote which caused some, justified, criticism, in the comments. 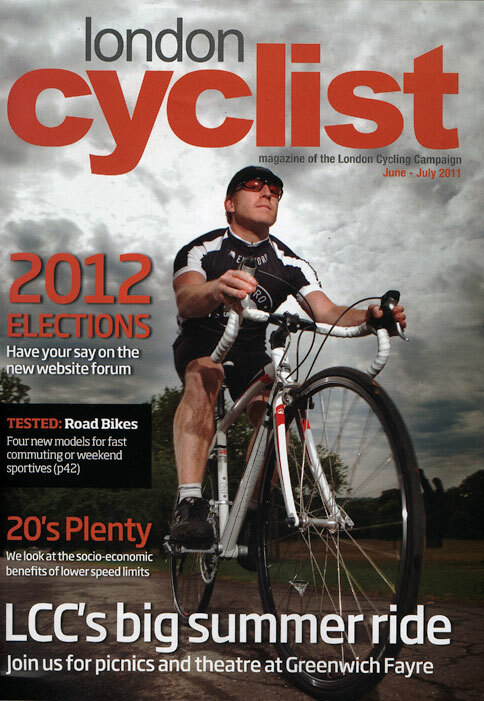 "But, apart from all that, this bloke on this bike does sit oddly next to the cover headlines concerning the 2012 elections (would this man be that interested in what cycle facilities Boris Johnson or Ken Livingstone were to offer him?) and the "20's Plenty" campaign (surely he would exceed 20 on the middle chainring, on the flat)." That bloke could be me. I have a road bike, lycra ... and a passionate interest in politics, Blackfriars Bridge and the lowering of speed limits. Only last Saturday in the company of around 60 of similar appearance and unsurpringly to me that interest was largely shared. Unlike. I find, in may other social groups I inhabit. Oh and I have a Brompton too. I find your stereotyping of people's opinions and interests by the dress they wear/bike they are photographed on unhelpful. I would also venture to suggest it is inaccurate. Yes, you're right STF, that paragraph was unfair. I was looking for a way to explain a problem of disjunct between message and image that is definitely present in that cover, but the way I put it was unfair, and I should have deleted that paragraph. But I stand by the general idea of the post. We had some of these magazines on a stall I was on this weekend trying to "sell" LCC to the public. I didn't think this cover helped us sell it, or helped us to explain what we were about. 99.9% of people would look at that cover and think: "That's not me – and never will be". And also, the bloke on that cover could be me as well – except for the drop handlebars: I've never been able to get on with them. As Gary Fisher said, "Anyone who rides a bike is a friend of mine". You're right, clothes and type of bike don't matter. Thanks David. BTW I am with you 150% on the new LCC branding. Campaign was the most important of the three words to me. A pity to drop it. I've just returned home after helping at the Cyclists' Breakfast that Camden Cyclists held. Our first callers wore pinstripe suits, one was wearing a tie. Many others were formally attired and all wore ordinary clothes. There was no Lycra and few people wore shorts of any description. There were many hi-viz jackets and helmets. Aside from these, just about all our many breakfasters looked 'normal'. Utility cyclists like this. I think I sit somewhere between the two groups mentioned. Yes I am a commuter - but I do wear lycra (well I have shorts over the lycra pants! The reason for this is mostly because after 11 miles into work I am soaked with sweat and there is no way I could use my work clothes - I need lycra because it dries quickly during the day so I can cycle back in it. Like you admitted above the bikes / clothes of a person should not detract from their reasons for cycling or their commitment to the political agenda. I do agree though whole heartedly that we need to move away from this image of cyclists in order to bring in more people. Point is many cyclists and would be cyclists don't want to look like aliens from outer space and may not relate to those that do. I stopped at that cyclist breakfast the other day. It was a welcome sight! Thanks for the free orange juice and banana. I can corroborate that the minority were wearing lycra and the "norms" were in the majority. I agree with this post. My girlfriend calls me a "cyclist" mainly because I enjoy riding as an extension of my personal freedom. Whilst I enjoy riding, I don't enjoy the conditions on our roads at the moment and I have no interest in riding competitively.